Since its establishment in 1919, the O. Henry Prize stories collection has offered an exciting selection of the best stories published in hundreds of literary magazines every year. Such classic works of American literature as Ernest Hemingway’s The Killers (1927); William Faulkner’s Barn Burning (1939); Carson McCuller’s A Tree. A Rock. A Cloud (1943); Shirley Jackson’s The Lottery (1949); J.D. Salinger’s For Esme with Love and Squalor (1963); John Cheever’s The Country Husband (1956) ; and Flannery O’Conner’s Everything that Rises Must Converge (1963) all were O. Henry Prize stories. An accomplished new series editor--novelist and short story writer Laura Furman--has read more than a thousand stories to identify the 20 winners, each one a pleasure to read today, each one a potential classic. 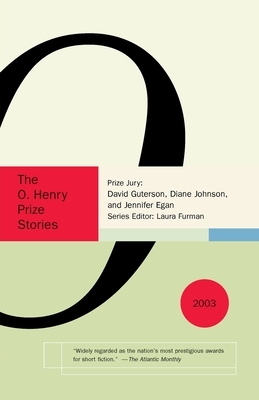 The O. Henry Prize Stories 2003 also contains brief essays from each of the three distinguished judges on their favorite story, and comments from the prize-winning writers on what inspired their stories. There is nothing like the ever rich, surprising, and original O. Henry collection for enjoying the contemporary short story. Laura Furman's work has appeared in The New Yorker, Vanity Fair, Ploughshares, The Yale Review, and other magazines. She is the founding editor of the highly regarded American Short Fiction (three-time finalist for the American Magazine Award). A professor of English at the University of Texas at Austin, she teaches in the graduate James A. Michener Center for writers. She lives in Austin.